Did they really change your life? Well…not really. But here’s a post on my albatross bar conversion. There are two reasons for this post. First, I’ve been asked to comment on this and I’m always happy to provide requested information. Answering questions gives me confidence that I’ll have a least one person who’ll read (or at least look at) the results of my efforts. The second reason is that I’ve been wanting to describe my impressions anyway. I just haven’t been ready, until now, to do so. The title is a hint as to why I haven’t been ready to write on this subject. Everything I had to say would have been gushing with the over-dramatic. So let me give a more controlled bottom line impression. I am enjoying the new bars very much. More details are provided below. Why change from drop bars to albatross bars? For me, it had nothing to do with solving any kind of problem, or making any kind of change of use of my A. Homer Hilsen. I’ve been comfortable on drop bars for decades, especially the Nitto Noodles with the flat ramps. 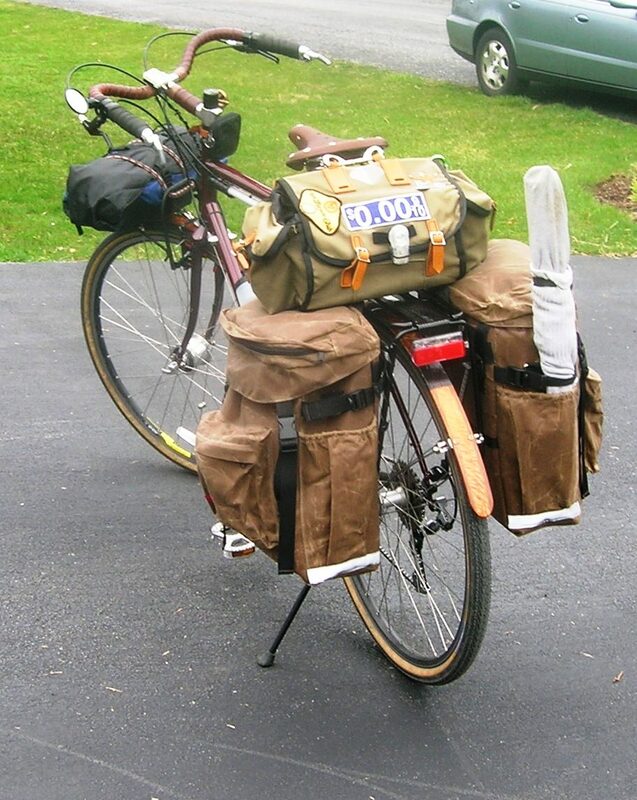 I plan to do the same kind of rides, carry the same kind of loads, and pedal the same terrain as always. So if things are good, where is the motivation? I confess that I sometimes make decisions on nothing but looks. I saw photos of Rivendell bicycles set-up with albatross bars and thought (as Grant has opined) that the albatross might be the prettiest handlebar out there. In fact, I installed these bars several times, trying to force myself to like them unsuccessfully before this time. Just because I like the way they look. Why was my conversion successful this time? I think there were two reasons for ultimate success. The first reason is a change in configuration. Originally, I had followed suggestions to install a longer stem to counter the dramatic sweep-back of the bar. But, for me, that resulted in a back angle and pressure on my palms that I just couldn’t live with. For some reason, I decided to try the same stem I used with my drop bars, and that resulted (as hoped) in the celebrated sit-more-upright position that I imagined, and put less weight on my palms. To my delight, it did not pose a bar-to-knee clearance problem when turning. The second reason for success is probably allowing for some adjustment time. The sit-up-and-see advantage was immediately apparent, but there is no denying that my hands didn’t have their usual, ingrained-over-decades, familiar positioning. My hands didn’t just drape over the bar in a way that felt ‘right’. But after only a few hours, I adapted to a few new ‘usual’ positions and discovered numerable alternate positons. Now the oddness has disappeared, leaving me with the wonderful benefits normally ascribed to these bars…fantastic vision, comfort, and a variety of hand positions. Oh yeah, and handsomeness. So are there any drawbacks? Not for me. One reason I didn’t make the conversion earlier is that I imagined myself as a serious/performance cyclist. I wanted to be taken seriously and I wanted to be able to travel long distances, carry touring loads, and turn on the speed occasionally. Don’t people who do those things use drop bars, right? I’m finally mature enough to recognize that I’m not what people who consider themselves to be serious/performance cyclists are by a long shot…and nobody takes me seriously. There is no question that sitting more upright results in more wind resistance. But at my pokey speeds, it isn’t very much. Sometimes it seems like I’m riding slower, but I look down and see myself pedaling the same gears with the same cadence as always. Maybe it seems slower because my body position is less ‘aggresive’…or maybe because my line of sight is farther down the road. In a strong headwind, I’ll bet I ride slower. But it’s been years since I’ve associated speed with performance. These days I associate performance…with fun…and fun is the conclusion of the matter for me. So are albatross bars fun? Oh yeah. To me drop bars look like ram’s horns and usually result in a more aggresive riding position. Albatross bars look like wings and usually result in a relaxed, casual position that feels more like flying. The additional width, along with the greater separation between middle-aged-belly and knees, helps open up my breathing system. For my cyclotourist style of riding, the greater ability to visiually soak in my surroundings adds significantly to my enjoyment. It seems to me that these bars feel and look more like a better match with the kind of riding I’ve been doing for the last 7-8 years. After selling my custom ti race bike…returning to steel, switching to wider tires, trading clipless for platform pedals, and adding racks, bags, and a liberal amount of personal comforts for a day’s outing, maybe the switch from drops to albatross bars is the last step in putting that old racing mentality out of my life. Maybe albatross bars didn’t really change my life, but they did make one of the enjoyable things in my life more enjoyable. Thanks for this! I think you just decided me on the bars to use in turning a fixed porter to a geared road bike. Hoping for one of your state of the bike updates then. You should have never posted this……I’m probably going to be looking at bars, levers and other doodads now. I might have been the first to request your thoughts on the bar change. You seemed reluctant to budge, and I thought maybe you didn’t have it in you. Boy, was I wrong. That was a powerful post. Most revealing was your observation that we with out heads down over the drops don’t appreciate the scenery very well. We are positioned to watch the pavement unraveling and rolling under our front tire — sometimes little else. I have a naturally strong sense of the aesthetic and your Abatross bars really stood out for me in that respect. Your bike is now stunning. I do not own a bike in that same category, but I’ve been looking around for one. I prefer to avoid the old fashioned quill stem, for no particular reason. I’m noticing the Honey ”All Roads” and the Seven ”Evergreen,” both bikes built in the greater Boston area. Dave Moulten, the famoust frame builder, posts every few days. He strongly advocates for stem and bar to be considerably lower than saddle, which, as he points out, positions us for a more powerful pedal thrust. I live close to a public loop trail where I can time myself with different bikes and different configurations. Riding the same race bike, I can post times of sixty-six minutes with a level stem, and seventy-two minutes with a riser stem. My thought is that the riser stem costs me both in wind resistance and in less efficient pedal thrust, but I appreciate the beautiful riverine setting more with the riser stem. I like a Brooks Swift saddle with the level stem, but prefer the broad, flat Berthoud Mende saddle with the riser stem and the more upright stance. This all sounds reasonable to me. I toyed with albatross bars. I settled for porteurs. Admitedly, my bike looks like something out of the 1950’s France now, but I like that. Full fenders and all. It’s a tourist position. And really, I can look down and see pavement anywhere. Looking around is more fun. Yes, those bars have always looked attractive to me. For most people, more upright riding is a great addition as we grow older. Personally, I’ve needed to sit more upright while keeping the longer reach of a drop bar. For now, mustache bars are filling that niche. Thanks for your thoughts. I’ve been thinking for quite some time about switching to Albas on my rSogn. My neck doesn’t really care for drop bars. I’ll save a few bucks by trying the current stem – only adjusting it if necessary. It sure would be great if bars could help that neck problem. Funny how people find out and follow the wisdom of the British touring roadster. Appreciated, and convincing for SeaFoam. I have “ram horn” bikes. Seems like I need one on which I can smell the roses. For some reason, I was immediately taken with the quality of your lead in photo: such a simple picture, but it was well done. Sigh… I need to try to practice photography some time instead of just snap shots. I’ve tried Alba (knockoffs) on my Crosscheck a few times. I too love the way they look, but the riding position still feels a bit too “Mary Popinish” for me. My background isn’t in drop bars, but mountain bike bar variations. 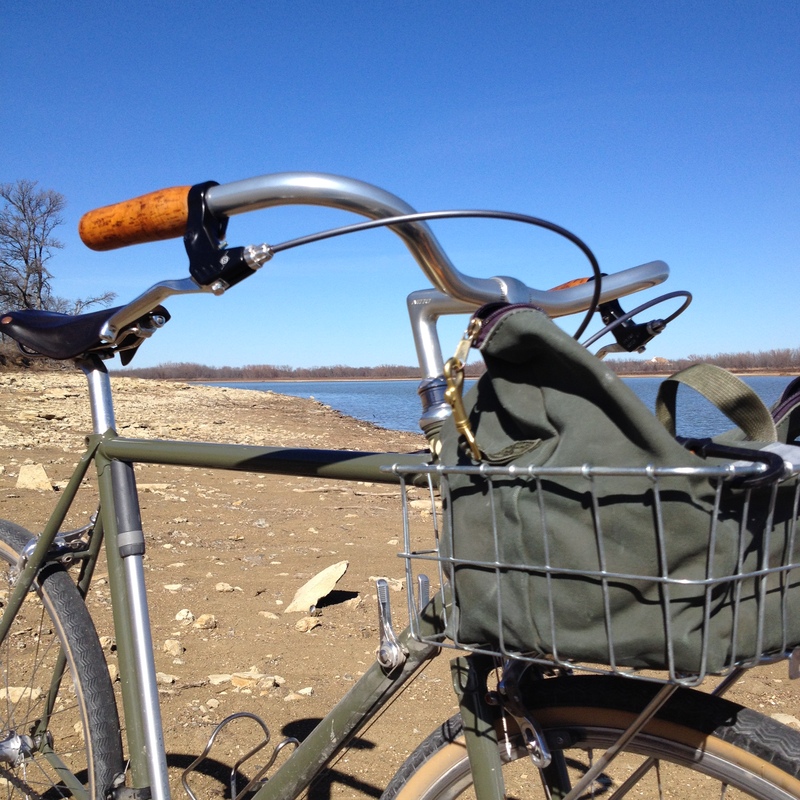 Which is maybe why I like my Surly Open Bar: kind of the same bend, but quite a bit wider. But I miss that lovely polished finish. Thanks for the encouragement. I’m no photographer. I just press the shutter button a lot, and sometimes something usable shows up. I agree with the Mary Poppins analogy. The thing that surprises me is that comfort doesn’t seem to slow me down. Those Surly bars also look great to me. Really enjoy your posts. The albotros bars look great on the bike and I am in agreement that for an older guy like me what I loose in riding performance I pickup in overall enjoyment of the ride. I installed a set of similarly swept metropolis bars last year and love the conversion from the original flat bar. My LHT went from drops to Alba’s a few years back, mainly for fit reasons; but quickly realizing that the view is an incredible benefit. I’m now mentally exploring doing the same with an aluminum rando-ish bike, and maybe putting gravel tires on it. The biggest challenge I had/have is overcoming the mindset that bikes like this are meant to have drop bars, and it somehow affirms my status as part of the touring crowd. But then rationality sets in, and I find myself tootling about with the Alba’s, just having fun and smiling. As a corollary to the Mary Poppins effect, I find people wave more if you’re riding with Alba’s. Ah yes, overcoming the mindset. I totally agree. However, since I rarely even see another bicycle on my excursions, there is no crowd of any kind to be a part of. You’d think I would have made the change much sooner. I don’t always want drop bars and this type of setup permits you to see the surroundings a bit better, IMHO. Now, do you need a copy of Ancient Mariner? Thanks for posting this. I gave them a try about 4 years ago, also with a longer stem. I’ve been itching to try again, and this might be the right encouragement. After doing research on the Dutch bicycle culture and 50 is on the horizon I now appreciate riding upright. For all the reasons in the article plus the ability to have more situational awareness especially when it comes to my (& other) children on Greenaways and school bike trains. I find it nice to talk to my wife and passers by. I drive 70k miles a year and I’m tried of looking at pavement and stripes. Thanks for the note, Robert. I completely share your perspective on situational awareness and the encouragement to socialize. I drive a lot of miles each year compared to most folks, but not you. But I sure understand the weariness of pavement and stripes. I just ordered Albas, levers, and grips from Rivendell for my own switch from drops to Albas, so I’m glad I found this post. I had been wondering about needing a longer stem or not. My reach is currently a little long-ish, so I think I’ll be fine as-is. But I am also wondering how you like shifting from the down tube after you made the swap; it seems like a long stretch! The downtube shifter reach doesn’t bother me. It seems like reaching for a bottle which also doesn’t bother me. I ride a fairly small frame, I’m in no hurry, and I probably don’t shift as much as many. That said, I just built up an Atlantis with stem shifters that are working out very nicely. I might switch to stem shifters on my AHH one day…or maybe not. I’m still enjoying a bit of variety at this point but the Alba’s on my XO-3 are pretty darn comfy and excellent for keeping an eye out for treacherous winter ice patches! Ha, ha! Funny thing is I’m thinking of putting some drop bars on my QB temporarily between now and the 2015 Lake Pepin Three Speed Tour. I’m missing the fixed gear and faster tires…so it might get a little zipper for 2-3 months…then back to British Roadster mode. Still a huge albatross bar fan. I made the switch over time as well. From drops on my early racing frames to moustache (on a Bridgestone XO-1 and subsequent Atlantis) to albatross bars on my just received Hillborne. Comfort is definitely a factor. But the biggest influence for me is my reduced focus on riding for speed/time. At 50, I’m just not as competitive in my head (body notwithstanding). I am putting in longer rides these days. As you said, the focus is on fun and enjoyment, not trying to get that 23 mile loop in as quickly as possible. Thanks for the thoughtful post. It is such a joy to hear from folks who seem to connect with my situation. Thanks for the encouragement, and happy saddle time!